When I was little I was a big fan of Sarah Kay, so when a design came out on the Cross Stitcher magazine (issue 185) I decided I had to stitch it. I actually started it on April but I kind of lost interest in it for a while. 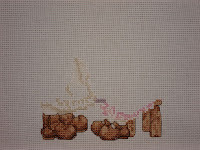 I'm stitching it on 14ct Whithe Aida, at first I didn't like how it was looking...the crosses seemed to big but now that I've done a little bit of backstitch I think the shoes look so cute and I'm enjoying working on it again. Cuando era pequeña los diseños de Sara Kay me encantaban, por eso cuando vi un diseño de estas niñitas en la revista Cross Stitcher (#185) decidí bordarlas. Las comencé en abril, pero luego perdí un poco el interés en ellas. Estoy bordando sobre Aida 14ct, al comienzo no me gustaba como me estaba quedando, las cruces me parecían enormes pero ahora que he realizado un poco el delineado del diseño me gustan como se ven los zapatitos y estoy nuevamente disfrutando trabajar en él. Para Alma Verónica y Nela que preguntaron cómo planeaba terminar este diseño, pues decidí terminarlo como un pinkeep. Mi plan original era hacerlo este fin de semana pero al no tener todo el material necesario y como tenía pereza de salir a comprarlo, el montaje lo dejaré para después. Thanks for your visit and comments :) !! Gracias por visitar y comentar en mi blog :) !! I loved many designs that came inside the latest issue of the online magazine TGOSM, Opalescent Hearts is one of them. 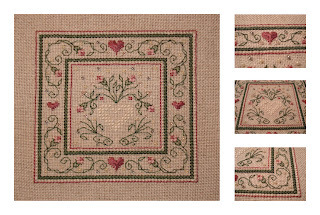 It's the first time I stitch Rhode Hearts and I think they are beautiful and not to difficult to make as I thought they were when I initially saw them. I didn't have the Mill Hills beads that were called for this design, so I replaced them with what I had on my stash, I used Mill Hill #02001 - 02022 - 03050. I left out the paillettes because (a) I didn't have any in my stash, and (b) I like how the design looks without them. 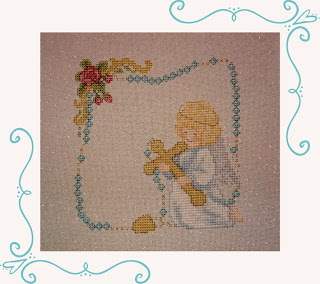 I did have enough fabric to finish "Angel Rosary" as a little bourse. You were right Vonna, I wanted to do a bourse for my mom so she could carry her rosary in it. It was really easy to make, as I said in previous posts I followed the step by step that Isabelle posted on the Focus on Finishing blog ...thanks Isabelle! Finalmente sí pude terminar la labor del angelito como un pequeño "bourse". Apenas lo terminé se lo entregue a mi mamá y me alegra mucho decir que le encanta :) . Estos bolsitos son super fáciles de hacer, definitivamente no será la última vez que haga uno. What has been your most challenging project and why? I have 2 projects that were quite challenging for me to do, not because of their difficulty but because they were big and I got a little bit bored while stitching them. The first one was Autumn's Praise by Gloria & Pat that I did on 2004, it was a commissioned work and a lot of pressure was put on me by this person who kept calling and calling continuously to ask it was already finished, she must have imagined I was a machine ;) . And the other one was Roadster Santa by Dimensions and it was challenging because of its size, it's the largest project I've ever done and I tend to get bored quite easily. Well I finally finished this little design, as you can see it's an angel holding a rosary. I wanted him (or is it a she?? )...well I wanted him/her to be a brunette but I was too lazy to do a color conversion so I decided to stick with the colors the chart called for it. I didn't have DMM 5282 so I replaced it with Madeira Metallic N°3004 that I had in my stash. 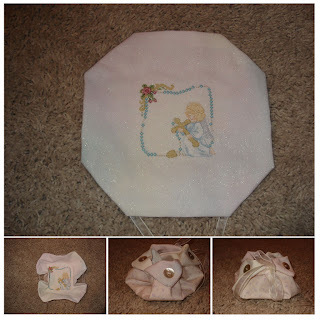 As I told you in my previous post this will be a gift for my mom, I wanted to finish it as a bourse using the tutorial Isabelle made on the Focus on Finishing blog but I think I cut the fabric to short...I'm still going to try to do it and if the fabric is to short I'll find another way to finish it. Por fin terminé de bordar este pequeño angel sosteniendo un rosario. Pensaba cambiarle el color de cabello para que sea oscuro pero me dio un poquitín de pereza así que al final lo hice rubio tal como lo indicaba el patrón. El único cambio que hice fue en el hilo metálico pues no tenía el DMM5282 así que lo reemplecé por Madeira Metalico N°3004. Como mencione en mi post anterior va a ser un regalo para mi mamá, pensaba terminarlo como un pequeño "bourse" pero creo que no tengo suficiente tela, así que si no me sale eso ya buscare alguna manera de darle un acabado a esta labor.